Cycling Weekly is launching its own sportive on October 9, 2011, with three different routes taking in some of Surrey’s finest countryside. Each of the routes starts with the climb of Box Hill before heading out in to the quiet Surrey lanes. Run in conjunction with www.ukcyclingevents.co.uk we’re offering three routes to cater for all abilities. A 33-mile Fun route, a 73-mile Standard route and 100-mile Epic route. 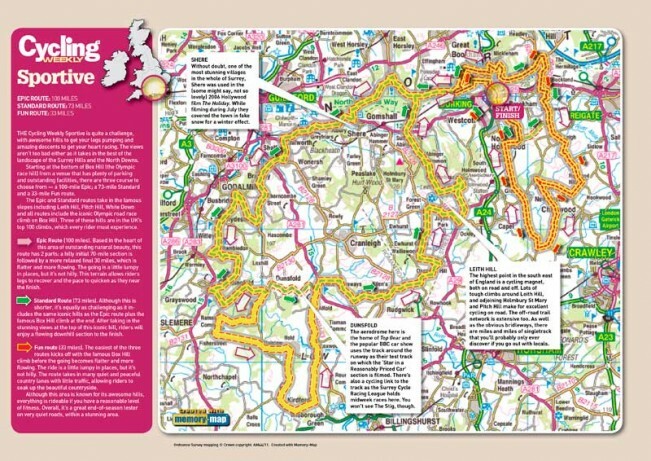 The two longer routes will test any riders as they take in some of the Surrey Hills’ toughest roads. Leith Hill, Pitch Hill and White Down are all included as the routes head east to Godalming and Haslemere before heading back to the start in Dorking via Rudgewick, Forest Green and Abinger Hammer. But not only do we have a top-quality route, we aim to give you the best facilities before, during and after your ride. The route will be fully signposted and we’ll have mechanical support at the start and out on the road. There will of course be electronic timing and bike wash facilities at the end. Just don’t expect the editor to clean your bike for you. There’ll be free energy drink and food at the feed stops and on site catering. The start finish is at the Friends Life (formerly Friends Provident) offices in Pixham Lane, Dorking, Surrey RH4 1QA, providing plenty of parking and event centre facilities. Entry is just £25 (£15 for fun route), and if you enter before September 18 you’ll get a free HIGH5 race pack worth over £12.